Deputy Entertainment Editor Julie Crowley went to the Irish premiere of Float Like a Butterfly at the Everyman Theatre as part of the 63rd Cork Film Festival. It was attended by cast and crew. This film won the FIPRESCI Discovery Prize at the Toronto International Film Festival. 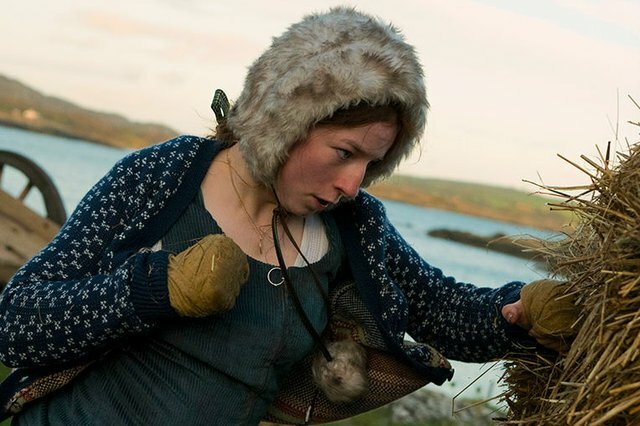 Float Like a Butterfly is a coming-of-age tale set in 60s Ireland, following a young Traveller girl named Frances (Hazel Doupe) who has ambitions to become a boxer. Directed by Carmel Winters, the film was shot on location in Ireland. The film’s setting is evoked through old-fashioned horse-drawn wagons and period clothes. Frances and her younger brother Patrick (Johnny Collins) suffer trauma at an early age when their pregnant mother is killed during a confrontation with the guards, and her father is jailed unjustly. Raised by her grandparents and extended family, Frances grows up to become a plucky young woman. She idolises Muhammad Ali and trains constantly because she wants to become a boxer. When her father Michael (Dara Devaney) is released from prison, he has strict ideas about how his children should behave, which creates tension in the newly-reunited family. He decides that they should leave the campsite and hit the road. Frances faces discrimination inside and outside her community. The Guards, farmers, and shopkeepers make no secret of their dislike of Travellers. They are constantly regarded with distrust and they can’t rely on the law to protect them. It leads to dangerous scenarios for Frances and her family. The ugly discrimination can become deadly. Meanwhile, some of Frances’ family members, including her father, think that she should give up on her dreams and get married, have children and do household tasks. Her father orders her to drop out of school and decides to arrange a marriage for her with his friend’s son, without even asking Frances. Her boxing ambitions are seen as unusual and unfeminine. She desperately wants her father to be proud of her but he wants her to conform to how he thinks a woman should behave. Changing social mores are shown when the family visit a cousin who has married a ‘settled’ woman and distanced himself from his Traveller roots. He lives in a fancy contemporary house with his wife and children. Some neighbours look down on them. Michael is disgusted by his seeming abandonment of his ancestry, which leads to an angry confrontation. The soundtrack features traditional Irish music, Sean-nós and old Traveller songs. The songs are an important connection between Frances and her late mother, who is often in her thoughts. The Travellers sing songs by the campfire in peaceful scenes of unity. The community members work together and help each other. When Frances’ family leave the campsite, she can’t rely on her extended family for help. This leaves her, Patrick and Michael in a vulnerable position. She has to become more independent. Frances’ father and brother are interesting characters who play an important role in her journey. Her father Michael is a complicated man who evokes sympathy and disgust. He’s short-tempered, often drunken, and he gambles. He believes that a man has a right to beat his wife and children. He tries to uphold patriarchal family structures, threatening violence if they disobey. Whenever Frances shows talent in traditionally masculine areas like boxing, hunting, skinning rabbits or siphoning petrol, he is dismissive and tells her to act more feminine. Conversely, he is harsh towards his young son, telling him to toughen up and act more violent. Despite his flaws, he can be a pitiful figure at times, when we see that he loves his children and grieves for his wife. He has occasional kind moments, such as buying a pair of boxing gloves for Frances. For much of the film he is in a toxic mindset and refuses to evolve his views. But he eventually does acknowledge the achievements of his children. Johnny Collins is a talented child actor who plays Frances’ younger brother Patrick. He’s sure to have a promising acting career. His character is gentle and kind to animals, disliking the sight of skinned rabbits. He loves his pet dog and his sister. His father is disappointed by his lack of violent instinct, encouraging him to get into fights and assert his dominance. This toxic masculinity is harmful to his son. It shows how outmoded gender stereotypes are harmful to boys as well as girls. The strong relationship between Frances and Patrick is an important emotional bond that motivates her. At the climax of the film, she has to protect him by using her fighting skills against the sergeant’s son. Float Like a Butterfly is a powerful film that challenges cultural and gender stereotypes. It celebrates female agency and empowerment. It features beautiful scenery of rural Ireland and strong performances from the cast. I highly recommend it.